Hundreds of firefighters from across the United Kingdom attended a high profile service of thanksgiving in Staffordshire this past weekend [May 10]. Staffs Chief Fire Officer Peter Dartford opened the service at the National Arboretum in Alrewas and said: "It is once again a privilege to welcome colleagues from across the United Kingdom to Staffordshire for this ceremony of thanksgiving and remembrance. It is particularly pertinent at the moment with firefighters from across the UK currently in Nepal assisting their colleagues in the aftermath of the earthquake in Nepal which has claimed the lives of thousands of people." 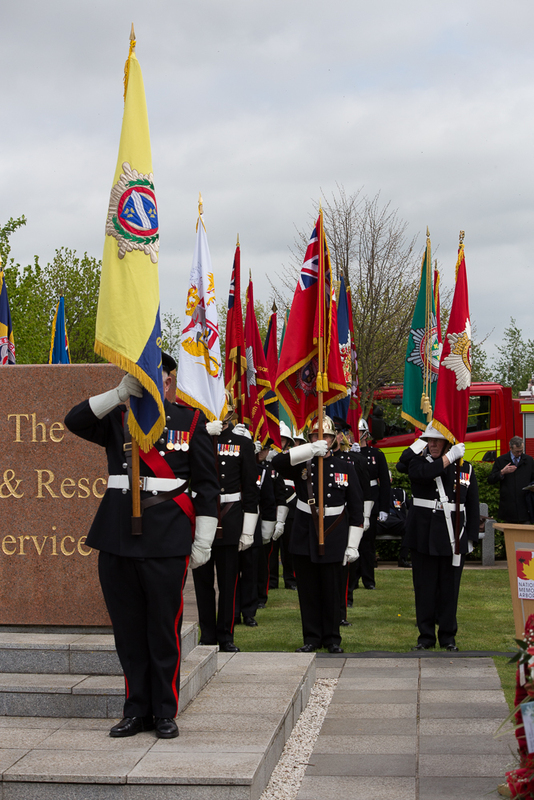 The ceremony, hosted by the Firefighters Memorial Trust, gave thanks to firefighters from the UK who protect communities at home and abroad, including those who are currently assisting with the rescue efforts in the wake of the devastating earthquake in Nepal including international Fire and Rescue Service colleagues. Director of Prevent and Protect Dean Stevens also represented the Service along with Chairman of the Fire and Rescue Authority Councillor Len Bloomer as they were joined by representatives from Fire and Rescue Services from across the UK. The National Fire Cadets provided a guard of honour and co-ordinate the laying of personal and Service wreaths. The Band of the West Midlands Fire Service also performed along with the Pipe Band of the West Midlands Fire Service. The Choir of Cheshire Fire and Rescue Service. CFO Dartford added: "It is once again a privilege to welcome colleagues from across the United Kingdom to Staffordshire for this ceremony of thanksgiving and remembrance. It is particularly pertinent at the moment with firefighters from across the UK currently in Nepal assisting their colleagues in the aftermath of the earthquake in Nepal which has claimed the lives of thousands of people. "Firefighters risk their lives on a daily basis in order to keep the communities that they serve safe. Their courage and dedication is an inspiration as they deal with major incidents such as wildfires that can destroy entire communities to house fires and road traffic collisions which threaten the lives of those involved. "The Annual International Service of Thanksgiving is always an incredibly moving occasion where we say thank-you to serving crew members and take the time to remember and appreciate our colleagues who have sacrificed their own lives in order to help others."